@LadyGaufrette I know which one I dislike more, but they both are horrific. Interesting speculations. I wonder if that child will be the protagonist of 25 years old of the next Trilogy. I also wonder if this child will be the son of Rey and Ben. If the one behind the glass was not Kylo but Anakin trying to get Padme back? The other thought was that Rey was born of the Force as a complementary AEons to the darkness of Kylo. I'll explain better. I wrote my theory about Star Wars Gnostic. I will therefore start from that theory. My new theory is that force always creates two complementary ones in search of equilibrium. These complementaries can choose to fight forever (like Obi Wan and Darth Maul) or love each other like Anakin and Padme. In this theory force does not have to choose two Jedi or Sith because the vital energy pervades everything. What unites these two opposing Aeons should bring the balance but everything depends on whether the opposites decide to love each other or to hate each other. But the loss of an aeon (the death of Darth Maul, the death of Padme) brings imbalance in the Force. So Rey (who is not a clone of anyone but only the Force that creates endless pairs of opposites) and Ben should individually get to choose to love each other because love would be the only balance in the Force. Sure- she is the CLONE who has a different gender and looks, acts and behaves nothing like Palpatine so what would be the point? She would be heir to an Empire that doesn't even exist anymore- the FO is inspired by the Empire but it's not a kingdom she can inherit by blood, so again what would be the point??? About the helmet/mask thing...I don't know- if they gonna bring it back I don't think it would be used much. But I highly doubt it. It would be such a waste of Adam Drivers phenomenal acting skills- especially his micro expressions. So the reddit and 4chan leaks are 2 different people? Yeah two different people but it’s looking like that Reddit leak is true certainly when it comes to kylo’s helmet. I urge calm, until footage is seen, and even then, it could be marketing/teaser trailer misdirect. If there is truth to this - it is based on a marketing meeting; therefore, it could be toy related. I am not certain of the reason why, yet toys do not always align with the movie. Or, they place emphasis on looks, which are only featured for a small (sometimes insignificant) time in the movie. If plot related, we don't know where this aligns with the plot. Again, I urge calm, until footage is seen. I know this is a drought, yet remember, we're in a dark room feeling things and trying to guess what it is. Rey's outfit won't have much of "Jedi Elements"... They're goin for the opposite. Her costume is described to me as a "Tatical" with neutral colors. The best way my friend could describe it to me, is that looked like a mix betwen Rey's previous costumes, and the "Starkiller Hero" design Ralph McQuarrie did for the original Star Wars. Any crack spoilers coincide with that plot? If this is true I wonder exactly where Reylo development will fit in. I'm sure they'll meet during the third act (the guy who leaked Kylo's mask said they fight in the third act) but hopefully before that as well. Well something definitely leaked judging by the amount of leaks we’ve had in last 24 hrs or so . Ok so am gonna play along with this one - starkiller hero concept art ? Does anyone know what that looks like ? Also Rey and Rose on an adventure together - interesting. I Wonder what sort of adventure and if they cross paths at any point with a particular man who is tall, dark and handsome and happens to be supreme leader of the galaxy . Interesting too that they’ve paired the girls together and the guys - makes me think of buddy road trip movies where anything can happen and people go off on all sorts of detours and distractions if you get my meaning lol! @Lovely_Rose wrote: Any crack spoilers coincide with that plot? If this is true I wonder exactly where Reylo development will fit in. I'm sure they'll meet during the third act (the guy who leaked Kylo's mask said they fight in the third act) but hopefully before that as well. I really hope JJ doesn't leave all the Reylo till the third act only. Sorry, I like Rose but I don't want to see 2 hours of Rey and Rose together on adventures. Pls no..
Maybe I am reading too much conspiracy books but I have the feeling that all this leaks that are suddenly appearing have something to do with the fact that the tlj script was found in the Oscar library and will probably leak sometime today. Rey and Kylo's dynamic was praised as being the best part in TLJ, so it's kind of annoying that it doesn't sound like there's more screentime this time around. Hopefully this is just act 1 stuff. But who knows. This is gonna start a new ship methinks lol! @AhsokaTano wrote: This is gonna start a new ship methinks lol! I think it already exists! I think I saw something about it on Tumblr. I know it’s always hard to judge these things, but that one feels plausible to me precisely because of the claim to not know anything beyond what an actual extra might know. My gold standard for leak veracity has always been whether or not it matches “jimjamjim” level of detail. He was the leaker who first revealed that Kylo’s lightsaber had a beam crossguard and that there would be a fight in a snowy forest where Rey got thrown into a tree. The leaker didn’t know if Rey was supposed to be alive or dead and didn’t have any dialogue to share; just snippets you’d be able to discern from looking at a couple seconds of actual filming (the lightsaber props all had lit elements so that their glow would be cast on things around them so he could identify the cross guard element and Rey going flying into the tree was a practical effect). Then they never posted again. 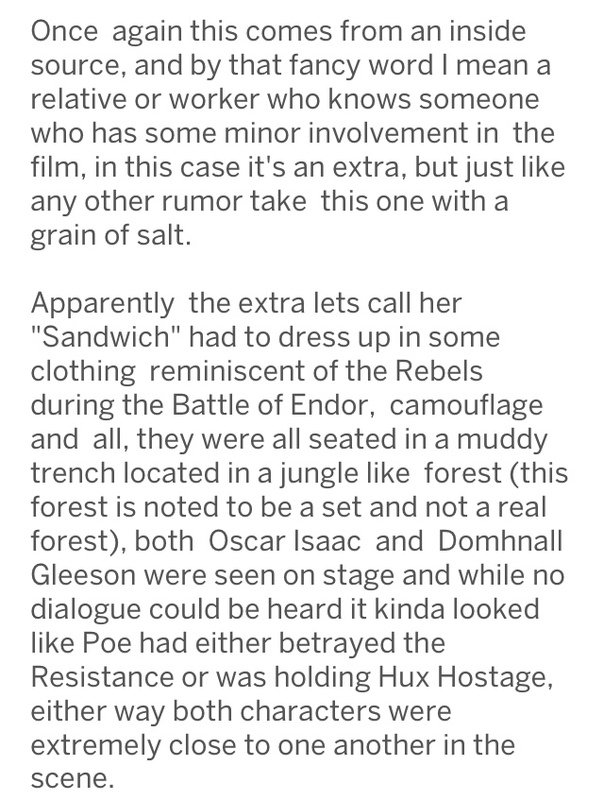 Here we have a description of what the extras were wearing and what the location was and that the extra saw Poe and Hux in close proximity, but didn’t hear any dialogue and guessed either Poe had turned evil or was taking Hux hostage. That’s jimjamjim level detail. No complete plot, no indication of where in the film it might be, no real indication of what was happening beyond that moment (Poe and Hux in close proximity and apparently some sort of heated exchange they couldn’t here). If we hear nothing further from that source I’d rank that well above most of the other rumors we’ve gotten in terms of credibility. Ooh didn’t realise that. I kind of put leaks in crack unless verified - maybe we should move this to spoilers then? I personally think putting Kylo's mask back on is pointless and regress in his character development. I will not comment on the mask coming back because the idea just makes my skin crawl, but Poe/Hux interactions, now that sounds good and makes sense. Do you think Hux can actually perform hand-to-hand combat? A Poe/Hux fight I cannot imagine him getting his hands dirty, but who knows? That would be something that would leave everyone gaping. Maybe they'll actually make themselves interesting for once and go off the cliff together, so to speak. It's gingerpilot if you're curious. And it's a really funny ship, their personnalities clash so much.